Imagine a world where all your devices starting from the air conditioner at home to your garage locking gets automatically operated, without your involvement? Or what if I say that you left your main door unlocked while hurrying to your office, and it automatically locks the very next moment? Yes, this is what the word IoT has promised us in the coming time! As per a recent report prepared by Statista, for 2020, the installed base of Internet of Things devices is forecast to grow to almost 31 billion worldwide. The concept of IoT has gained the spotlight in no time and has presented us things which we wouldn’t have imagined of. May it be smart cars, smart home, smart watch, smart locks, smart refrigerator, or smart chip, IoT has revolutionized all those industries which couldn’t fit with the computer world. All thanks to the latest technology trends! IoT has brought all the industries all together under its reach in no time and has made the world fully automated. Industry influencers are all set ready to experience the fully automated world with the new evolution of IoT into real practice! With the implementation of IoT, when all the devices get connected over the internet, managing such a huge network and maintaining security aspects becomes a major point to be focused on! And this is the point where the problem arises with IoT. As the existing architecture of IoT is based on a centralized model, all the devices connect through cloud servers for the processing and storage of the data. With so many devices connected at the moment, the server will get overloaded and this will act as a direct invitation to cyber attacks. For instance, if we talk about smart homes, the server would be set up somewhere locally, and it becomes easy for the hackers to peep into the network and fetch your personal information. The blockchain is a distributed and a cryptographically secure platform where the control is given to its every user. Due to its decentralized architecture, the power gets divided to the users itself, instead of holding data over one particular server. For security reasons, blockchain gives the data access to its users, but with tight security points. Any third person who tries to view the data will get the data in an encrypted form, which is unreadable to humans. The person holding the credentials (in the form of private key) will be able to view the data, while others won't have the access. How will Blockchain benefit IoT? What if we make the present IoT ecosystem as decentralized? This will enhance the connectivity amongst the devices and overcome almost all the above problems. This is exactly where blockchain makes an entry to rescue IoT from security-related concerns and other management concerns! Blockchain can directly fill the gap in IoT concept to overcome the security issues by offering decentralized structure to it. Implementing blockchain into IoT will allow multiple devices to connect reliably. As the data will not be held centrally, this will eliminate the possible threats and hacker attempts. Moreover, there will be 0% chances of attacks from third-party sources or the man in the middle attacks as the data isn't held on one particular server. To stay ahead of the market competition, organizations are welcoming the blockchain IoT concept into their business. Looking forward to a company that can cope up with the latest technology trends and integrates easily with your existing system! So, while you search for a company, make sure your Blockchain IoT app development company includes the following points. Data Management: As artificial intelligence and machine learning demand a wide data storage and data processing, make sure the company has a strong experience and skills in data aggregation from multiple sources for large-scale data management. Domain-specific knowledge: In order to attain better performance results and desired outputs, it is necessary that the company has a deep domain-specific knowledge in all the technical fields of your organization. Development complexity: To stay ahead of the other competitors in the industry, it becomes essential to deal with the complex business operations and data processing to attain better performance results. Make sure the company is capable enough to deal with the complex operations. All the way to a fully Blockchain IoT world will not be an easy journey. There will be shortcomings and challenges too along the way. Encryption carried out in blockchain demands a horsepower to be carried out, while IoT is unable to fulfill this presently. Moreover, there are chances of storage issues too as there will be an endless number of connected devices. 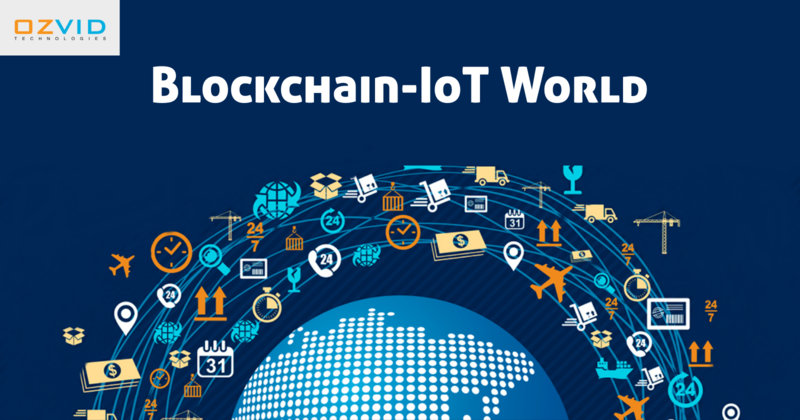 We simply can't assure at the moment that if Blockchain is the ultimate answer to IoT problems or not. But, definitely, it is going to benefit a lot, more than we have imagined! Get prepared for a Blockchain-IoT world!